Israeli soldiers invaded, on Sunday at dawn, many communities in the West Bank governorates of Bethlehem, Hebron, Qalqilia And Ramallah, searched and ransacked homes and abducted five Palestinians. Dozens of soldiers invaded the al-Jalazoun refugee camp, north of the central West Bank city of Ramallah, and abducted a child, identified as Mohammad al-Hattab. A video of his abduction, published by Quds News Network, shows the soldiers taking the child to an unknown destination, while his mother could be heard telling her child not to be afraid, and asking him to take care of himself. In relate news, the soldiers invaded homes in Harmala village, east of Bethlehem, and abducted Ahmad Sa’id Atallah and Salah Mousa Atallah and Hamza Awad Atallah. In Hebron, in southern West Bank, the soldiers invaded many homes and abducted Jihad Hafeth Jaber, from the Old City. 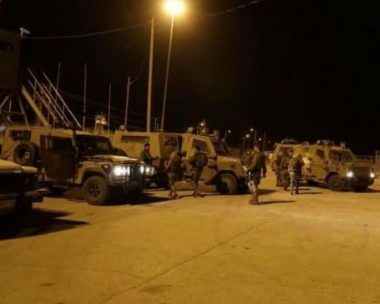 The soldiers also installed many roadblocks on main roads, south and east of Hebron governorate, before stopping and searching dozens of cars, interrogated many Palestinians while inspecting their ID cards, and deployed more soldiers around many villages and towns.